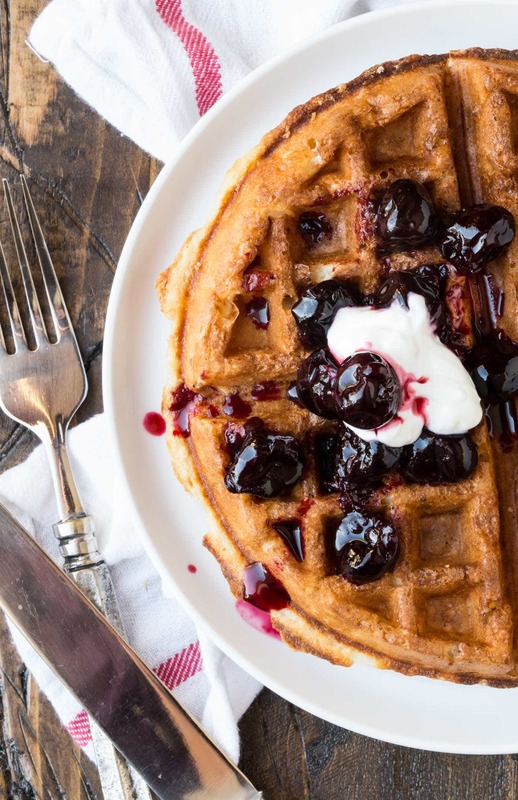 Follow our make-ahead tips, and these Buttermilk Waffles with Cherry-Vanilla Sauce will be the star of your next brunch menu! Serving waffles for brunch can seem like an overwhelming task. Who wants to man the waffle iron while everyone else enjoys themselves? 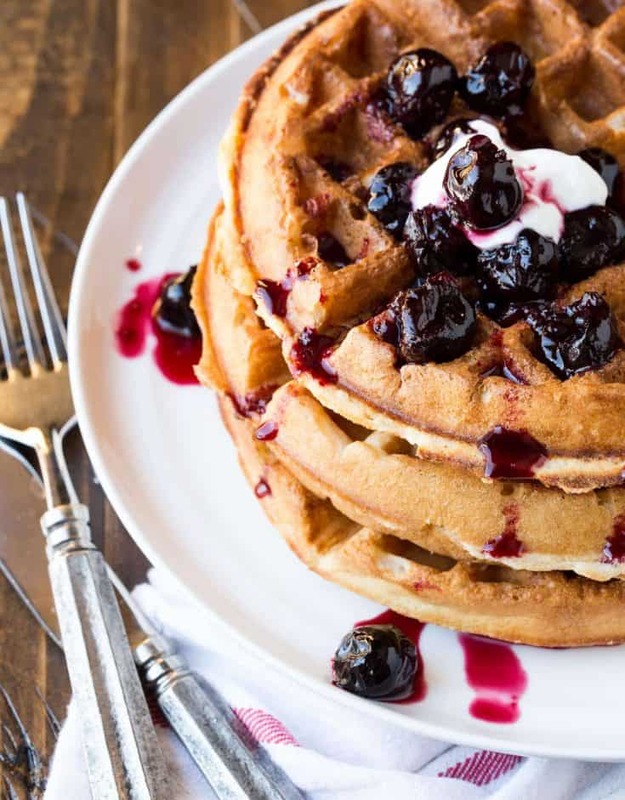 Stick with me here, because I have a little secret to successfully make batches of waffles that will allow you to relish these Buttermilk Waffles with Cherry-Vanilla Sauce at your next brunch. While I can’t recommend making waffles hours in advance, I can vouch that a low temperature oven does a fantastic job of keeping your waffles hot and crisp for up to a half hour before serving (any longer than that and the waffles start to dry out). Simply preheat the oven to 175 – 200 degrees. As the waffles finish cooking on the waffle iron, place them directly on the oven racks to keep them hot and crispy. Repeat with your remaining batter until you have enough waffles for a crowd. Tip: Another way to up your waffle productivity? Get a dual iron waffle maker! I got this Cuisinart Double Belgian Waffle Maker for Christmas a few years ago, and I looooooove it! Now that you are a waffle making machine, don’t forget the waffle toppings! Sure, you could go with the traditional maple syrup route, but I highly recommend adding a little variety to your waffle buffet. This Cherry-Vanilla Sauce is super simple to make and crazy good on these Buttermilk Waffles. Plus it can easily be made a few days ahead of time. Who knew making waffles for a crew could be so simple? P.S. Stuck with leftover waffles? Wrap the extras tightly and pop them in the freezer. A quick spin in the toaster brings them back to life the next day. Preheat oven to 175-200 degrees and turn on your waffle iron to desired temperature. Combine flour, sugar, baking powder and salt in a bowl and whisk to blend. Stir in buttermilk and 6 tablespoons melted butter. When the waffle iron is ready, brush with extra melted butter and pour 1/2 cup of batter (or more, depending on the size of your waffle iron) over each waffle grid. Cook until waffles are golden brown on both sides. Transfer waffles to oven racks to keep warm for up to 30 minutes. Repeat process with the remaining batter, brushing waffle iron with melted butter as needed.